Our first Burgundy Experience was held in 2010. The trip was a smash, and we've repeated the experience three times now. We see amazing sights, taste delectable wines, visit vineyards, chateaux, and domaines, yet what we most enjoy is sharing what we love; the Burgundy lifestyle with friends. Each planned experience evolves with its own wonderful surprises, anecdotes, laughter, and joyful moments. 2019 marks our 5th Burgundy Experience to date. We are so very excited for what awaits us. We invite you to Experience Burgundy, not as a touring participant, but as our friend. "Thank you for including us on a most memorable trip. You have created memories for us that will last a lifetime." "We feel so special to have spent this week with you. This has been a wonderful trip with two great people! Thank you!" "You have given us a life changing experience. We will never forget these exceptional days. This has been one of the best chapters of my life." "Merci beaucoup for the planning, hard work, and love that you have put into this tour. It has been great!" "Thank you so very much for planning and hosting this wonderful trip! Such a beautiful country and fantastic places!" "Fabulous wine, food and friendships. Merci beaucoup- c'est magnifique!" "This trip has been such a wonderful experience. Not just the knowledge and history, but finding ourselves surrounded by a new family." "Our trip to France will remain a cherished memory forever because of Both of YOU. We are honored to have had the opportunity to explore Bourgogne with you. It was quite wonderful to experience your passion and love for the people, the wines, and the country. We enjoyed being with your family and friends and we thank them for their warm hospitality. It was also a unique experience to spend time with fervent, yet warm-hearted winemakers truly immersed in their craft. Thank you for all your time, effort, thought you put forth to plan this amazing excursion. We will always treasure our Bourgogne memories." " Many Thanks for the wonderful "Burgundy Experience". We enjoyed the tours, the food, the people, and especially the wine. Both of you made the trip a memorable experience!" "Jack and I want to thank you for The Burgundy Experience trip! It was "tres magnifique"! 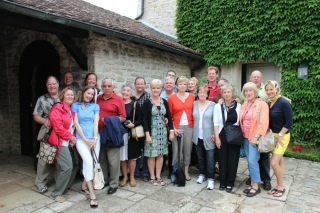 We thoroughly enjoyed the entire week in Burgundy. We appreciate you sharing your family, your school, your vast wine knowledge, and your friendship! It was so special and every day was perfect! Just the right amount of touring and wine. Thanks for the amount of time and effort you both put into make the trip so successful! We shall cherish it for years to comes well as the great wine education." " Art and I can't thank you enough for the trip to Burgundy. Thank you for all your time and thoughts that were put into making it such a special trip! We loved every minute of it. It was so fun learning so much, and seeing so many beautiful sights, and making so many dear friends. We enjoyed getting to know you better as well! We will treasure this trip because of you! Thanks, and much love"